Ingbert Liebing (born May 11, 1963) is a German politician and CDU member of the Bundestag, where he represents Nordfriesland – Dithmarschen Nord. Since November 2014 he has been serving as chairman of the CDU state party group of Schleswig-Holstein. Liebing has been a member of the German Bundestag since the 2005 national elections. Between 2005 and 2013, he served on the Committee on the Environment, Nature Conservation, Building and Nuclear Safety as well as on the Committee on Tourism. On the environment committee, he was his parliamentary group's rapporteur on marine conservation. In addition, he was the deputy chairman of the German delegation to the Baltic Sea Parliamentary Conference (BSPC) from 2005 to 2009. Since 2009, Liebing has been a member of the Sub-Committee on Municipal Policy, serving as the committee’s deputy chairman between 2009 and 2013. He also serves on the Committee on Economic Affairs and Energy. In 2013, he was elected as chairman of the Regional Government Association of the CDU/CSU (KPV). In the negotiations to form a Grand Coalition of Chancellor Angela Merkel's Christian Democrats (CDU together with the Bavarian CSU) and the Social Democrats (SPD) following the 2013 federal elections, Liebing was part of the CDU/CSU delegation in the working group on energy policy, led by Peter Altmaier and Hannelore Kraft. 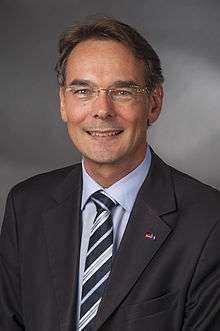 On 11 June 2016 Liebing was elected leading candidate for the Schleswig-Holstein state elections in May 2017. He received 91.86 percent of the delegates' votes. Later that year, he resigned from that role after consistently bad polling results. ↑ CDU-Landeschef Liebing verzichtet auf Kandidatur Die Welt, October 28, 2016.